This tiny country is so vibrant and has such contrast with beautiful green valley’s to mountains. When I was there I got some beaut photos of the mist around the mountains one morning. This is the place where you walk down the street and have tractors going past in amongst the cars. Because this country is mostly mountains this makes it a winter sport destination. They also have some very long forest walks which can take you from Vaduz to small villages in the mountains. The Principality of Liechtenstein is only 160kmsq. The capital is Vaduz with Schaan being the biggest city and Liechtenstein is not part of the EU. The biggest attraction which draws the tourist is the Castle of Liechtenstein which the current Prince lives in. You cannot go through the castle but can take a walk up there. 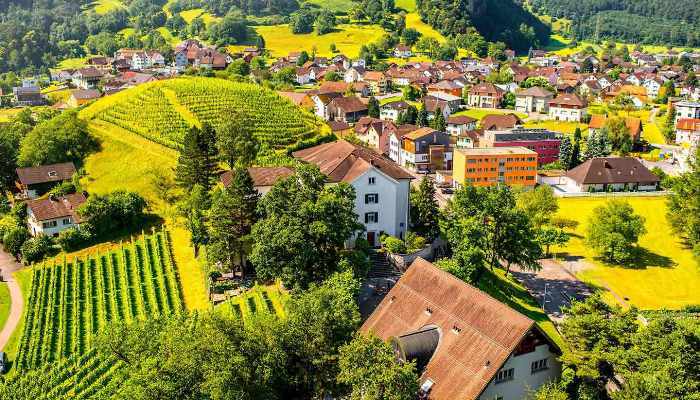 Up near the castle are some wonderful views of the valley below with its vineyards and farming and directly across the valley to the mountains in Switzerland. The river Rhine is the border. There is a good tourist office in Schaan and they are most helpful answering every question I could come up with and souvenir shops. There are restaurants, cafes and shopping but I found them to be a little on the expensive side. The currency here is the Swiss Franc. 1) Don’t forget to get your passport stamped from the tourist office. It’s not official of course but one of things us tourist like to do. 2) Visit the postage stamp museum. 3) Go to the Kunstmuseum. 4) Walk up to the castle. 5) If you are staying for some time there are several hiking tracks to hike. 6) Catch a bus and get off near the river Rhine for an afternoon stroll. 7) If you are staying here you can catch a bus to Feldkrich in Austria – it’s about a ½ hr on the bus. 8) Get up early and go up to the castle if you want to get photos of the mountain tops above the mist. You will be glad you made the effort. 9) If your next destination is to be in Switzerland then you can catch a train from Sargans just over the border from the very south of Liechtenstein. 10) No worries travelling in this small Principality and if you need the internet there is one at the Postal Office which you can also print from.